Published: Aug. 26, 2016 at 07:24 p.m. Updated: Sept. 1, 2016 at 02:51 p.m. Welcome to the new age; this isn't the older generation's fantasy football world. Not long ago players like LaDanian Tomlinson, Shaun Alexander and Larry Johnson owned fantasy drafts and racked up points for championship winners every single year. But those days are dead, and they've been gone for a while now. With the rise of quarterback production and the outrageous influx of talent at the wide receiver position, it's all there. Just 13 running backs are among the top-30 players off the board in Fantasy Football Calculator's ADP, while 15 wide receivers inhabit that group. Among top-50 overall scorers in standard leagues in 2015 11 of them were running backs while 13 were wide receivers. That is a reversal from 13 to 12 in 2014 and nine to 15 in 2013. Some claim that 2015 was an outlier year that we should not overreact to. That same group preaches that the Zero-RB strategy is fool's gold and a birthed child of said overcorrection, never mind that author of the series Shawn Siegele published the first Zero-RB article in 2014 and used the strategy in competitive leagues the season prior. However, all the while the wide receiver has slowly been trending up and the running back on the exact opposite downward slope. A multitude of factors have contributed to the steady shift in the balance of power between the position, and whether the old guard wants to see it or not, every assertion that fantasy drafts should be wide receiver-heavy are grounded in data and facts. In this post I'll look at evidence from across the fantasy landscape that shows how the game has changed to favor wideouts and why we should adjust accordingly. I'll reference a ton of great work done by some excellent people in this industry and I highly suggest you read all of those, as well. As I state in my twitter bio, I most certainly do not have all the answers. Yet, collectively as a fantasy football community, we can come up with a clear answer as to whether we should be drafting wide receiver-heavy teams. We've all heard "the NFL is a passing league" more than enough times for the concept to be drilled into our heads. Quarterbacks rule the roost in the NFL and teams want to spread the field with multiple receiving options. Traditional fullbacks and blocking tight ends are essentially extinct and few teams center their offense around a ground game. RotoViz author Ben Gretch studied the changing NFL landscape in a two-part series this offseason where he examined league-wide trends. In part one of the series Gretch's research he laid out how the NFL continues grows more pass-heavy with each season. While the average of plays run per team is currently at the same level as it was in the first year of Gretch's study (1,033 in 1978 and 1,030 in 2015), the play-calling has almost flipped on its head. The NFL average for pass attempts per team in 2015 was 571 and 423 in 1978, while the NFL average for rush attempts per team was 421 in 2015 and 574 in 1978. As Gretch shows in this graph of every year in that span, it wasn't a sharp diversion; pass attempts are on an upward trend while rush attempts are going the opposite direction. Running back is the most opportunity-dependent position in fantasy football, and opportunity is the engine for which all positions accrue fantasy points. In general, the entire position sees less opportunity than ever before with each passing year as pass attempts rise. Unless you're projecting a reversal in the several decade trends toward the passing game, the running back will continue to be marginalized. Back in 2006, 12 running backs saw 65 percent or more of their team's rush attempts, while 10 more did in 2007 and 12 again in 2008. That number began to steadily trend downward to where only 10 did so in the last two seasons combined. The trend line has a bit more fluctuation when adjusted to 60 percent of the team rush attempts but is still on the downtick overall. Nine running backs saw that volume of their team rush attempts in 2006 and just eight combined the last two years. Perhaps the starkest change is the decline in high-level workhorse running backs. 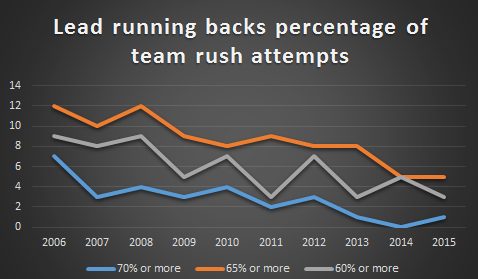 Seven running backs saw at least 70 percent of their team's rush attempts in 2006. The same amount of running backs reached that threshold from 2011 to 2015 combined. The era of the workhorse running back is nearly dead-and-gone, buried, extinct and not coming back. The rise of backfield committees is just one of the ways that running backs suddenly became a painfully fragile position. Shawn Siegele's original article on Zero RB centered around the idea of constructing "Antifragile" teams, not just inherently ignoring running backs for the sake of it. He quotes author Nassim Nicholas Taleb in his book on the subject defining Antifragile, "some things benefit from shocks; they thrive and grow when exposed to volatility, randomness, disorder, and stressors and love adventure." We love football because of the twists and turns a season takes. The unexpected events that occur and surprises the NFL gives us from September to February keep us coming back for more like a pack of starved dogs. However, that unexpected reality also creates chaos, which sends ripples of distress crashing through all teams both in the actual league and those in the fantasy realm. The proliferation of the backfield committee has made the running back position more unpredictable and volatile in fantasy football than ever before, and the position's margin for error grows ever smaller as teams call less running plays with each passing season. This is likely just one of the reasons for Draft Sharks analyst Jared Smola's findings in his recent study on 2015 running back production that "RB2 and RB3 production appears to be declining, while RB4 and RB5+ production is increasing." We can also take this as an example of how the running backs later on in the draft can benefit more from the chaos we know will come from an NFL season. When starters go down or roles change, it is those rushers taken late in drafts or off the waiver wire that will assume fantasy starting roles. Receiving backs that go later in drafts also get a boost to their fantasy floors from the chaos of their teams losing often and giving them game scripts to be more productive (see: Riddick, Theo). The coaches splitting touches among running backs is just one reason the position is more fragile than most. However, there is no better example of the unexpected chaos that befalls fantasy players than injuries. We know the running back position was hit, and hit hard, by injuries in 2015. It was an apocalyptic scenario that Graham Barfield cautions us against seeing as anything but the outlier that it truly was. However, a few recent studies indicate that some positions are more likely to suffer serious injuries than others. Jeremy Funk of Dynasty Fantasy Football Factory was the first to publish research early this offseason showing the risks of drafting running backs over receivers. A PhD candidate in clinical epidemiology, Funk isn't just some run-of-the-mill fantasy analyst like me who dug through some data on the internet. He currently works with Harvard, Lahey Cancer Clinic and the Government to develop a cancer model to predict rehospitalization. His goal is to give doctors a risk score for their likelihood of patients developing a future illness, certain complications and how they are likely to succeed or fail a treatment plan. In his study of injury risk among NFL skill position players, Funk applied some of the same principles and thought processes he used in his research with his clinical work. He used an intense, unbiased methodology sampling running backs and wide receivers within the top 100 of ADP from 2009 to 2015. The group analyzed for his study ended up with over 480 players (a 50/50 split of running backs and receivers). In Funk's sample, 92 running backs suffered a significant injury (missing ¼ of the season) whereas only 70 wide receivers suffered a significant injury. That calculates out to a .3833 risk in running backs to a .2917 risk in wide receivers. Overall, Funk concludes in his research, "Early round running backs had about a 32 percent increased risk of missing significant playing time per season (four games missed) compared to that of wide receivers â¦ we would eliminate nearly 44 percent of potential injuries within our top eight picks by selecting wide receivers instead of running backs." There's not much else to say other than that Funk's findings here are ground-breaking and fantasy owners are putting themselves at a massive disadvantage if they don't consider them. More recently, Josh Hermsmeyer, a writer for RotoViz, also published a study quantifying injury rates. Hermsmeyer used the same frame of reference as Funk, the 2009 to 2015 season, for his research. At the conclusion of his study, he determined that "fantasy relevant (top 70 positional ADP) running backs are anywhere from 24-31 percent more likely to incur serious injury than fantasy relevant wide receivers (top 80 positional ADP)." The risk only increases as you go up through the draft. Per Hermsmeyer's study, "running backs drafted in the first five rounds are 200-360 percent more likely to suffer a serious injury than wide receivers." Again, this is critical information for fantasy owners to consider, especially because predicting injuries is not something we are good at. Dr. Jene Bramel of Footballguys asserts that it is reasonable to consider some players more likely to suffer an injury if they fit into certain categories. However, while NFL teams and their doctors can access most of the information on Bramel's list, those of us on our couch fiddling with fantasy lineups almost certainly cannot outside of "a player who has had repeated injuries to the same area", which was just one of eight categories. Dr. Bramel simply states, "Can you reliably predict whether a player will suffer an injury in any given week, month or season? Good luck -- especially if you're unable to make a precise argument based on one of the above factors." Certain studies assert that workload and the amount of touches a player sees can be helpful in predicting the likelihood of an injury. From a common sense standpoint, it makes sense; the more times a player has the ball, the more opportunities he has to take hits and get hurt as a result. Yet, Adam Harstad of Footballguys detailed that we might be wrong in assuming that a higher touches-per-game rate could be an indicator of future injury. Harstad notes in his research that "despite receiving the heaviest workload, no group of running backs was as likely to remain healthy as the workhorses." Age is another factor we anecdotally assume means a player is more likely to get hurt, but harkening back to Hermsmeyer's study, he "found no statistically significant relationship between age and injury for NFL wide receivers." We just don't have the kind of access as outsiders to be accurate predictors of injuries to particular players. What we do have, however, is substantial evidence to support the idea that running backs are at far greater risk for suffering an injury deemed "significant" than wide receivers, especially at the top. Rotoworld's data savant Rich Hribar already essentially wrote the wide receiver-heavy drafting Holy Book earlier this offseason. He laid out a complete and utterly convincing case on why the position is the new king of fantasy football unless the league as a whole, or our fake game experiences a dramatic change. Hribar is quite literally the best in business at this sort of data work and you should bookmark that column. Hribar shows that top-24 wide receiver scoring is up from 5,798.4 points in 2006 to 6,390 in 2015 in PPR formats. That wasn't a dramatic spike that came in the last few seasons, his heat map shows that this is something that's been trending up for a while. Hribar also demonstrated that while touchdowns have stayed within a similar range and lack a steady trend line, wide receivers are recording more yards and receptions than ever. It's that part of their production that is beefing up their scoring. In his article, Hribar showed that on the inverse, top-24 running back scoring is down from 6,201 in 2006 to 5,364.5 in 2014 before falling off a cliff to 4,837.7 last year. Again, 2015 was clearly and outlier but the overall scoring at the position was headed on a downward slope long before that. The only two sections that are consistently trending upward among running back scoring is the percentage of their points earned through receiving yards and receiving touchdowns, showing that even this position isn't immune to the influence of the NFL's move to an air-based league. Now, Hribar did utilize PPR scoring for his study, but lest you standard league purists believe you have your "AHA, GOTCHA" moment, he notes "there's the exact same overlap in hot and cold zones in standard scoring leagues, even though rushing statistics carry more non-PPR weight." The trend down for running back scoring exist across formats and Hribar actually informed us years ago that we overrate the effect of reception bonus scoring, anyway. I've presented a lot of season-long type of evidence so far, which runs contrary to a concept I always preach that "fantasy football is a weekly game, not a season-long one", after all. We're trying to win weeks, even in our roster management redraft leagues. No format has helped reinforce this idea more than that of daily fantasy football. Chris Raybon of 4for4 is one of the best and brightest minds in the DFS industry. He and his podcast partner (DFS MVP) TJ Hernandez scour over NFL data with tireless effort in the offseason to help players gain a weekly edge. In his offseason study of player consistency Raybon noted that wide receivers passed running backs as the third most consistent position in fantasy last year, behind quarterback and kicker. Raybon notes that when he began studying player consistency in 2013, "running backs were significantly more consistent" in half-point PPR scoring. However, that trend has also reversed and wide receivers are now more steady. In addition to being more consistent week to week, the ceiling is also higher for wide receivers, especially in DFS. Raybon asserts that "although running backs are now equally volatile as wide receivers (or perhaps more so), the top wide receivers tend to score more than the top running backs." The evidence continues to grow overwhelmingly in favor of wide receivers over running backs in both season-long and weekly formats. Their mix of consistency and overall higher point totals make them the clear better position in fantasy. The term "fantasy expert" gets thrown around a fair amount in our industry. Someone has still yet to inform me what a "fantasy expert" is and how one becomes qualified to don that title. I certainly don't remember filling out an application to be one and would rather no one refer to me as such. Without fully going down that rabbit hole of a rant, my point here is that we aren't all that great at predicting fantasy scoring. We've consistently noted in this study that 2015 was an apocalyptic outlier year for running backs in terms of injury rates and the decline in scoring. However, it was the 2014 season that was the outlier in terms of ADP predictability. A whopping 73.3 percent of top-15 drafted running backs finished within 12 spots of their ADP, while 56.7 percent of top-30 backs did so. Both data points were the highest rates at the running back position. So while 2014 was the "year of the running back" in some ways, the position overall has been harder to consistently predict based on average draft position year-in-and-year-out. 2015 might have been disastrous in terms of injuries and scoring but ADP's predictive nature of where running backs would finish actually normalized to more of an expected rate. 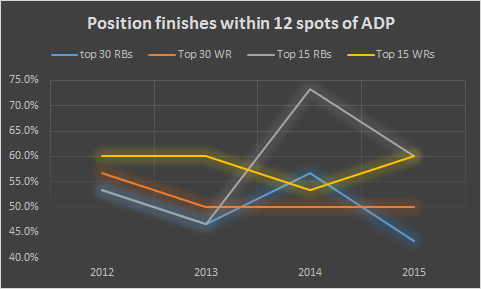 Wide receivers, on the other hand, has been far more consistent over the last four years in terms of ADP predictability. Both the top-30 and top-15 receivers have stayed within 50 and 60 percent predictability. Top-30 and top-15 wide receivers were either more than or at least as predictive as running backs in every season but one the last four years. JJ Zachariason of numberFire does excellent work with bust rates and his work on them this offseason helped him conclude that "selecting wide receivers early is smart and relying on wide receivers in the middle and late rounds is dumb, and we've certainly seen more running backs in the middle-to-late rounds succeed versus wide receivers." All of us, fans and analysts, overrate how much we know. In truth, we really don't know much at all about what's going to happen in the future. However, it does seem we are able to consistently predict, based on ADP, who the top wide receiver scorers will be. If you fail to see the objective evidence that points us to where the fantasy game is and has been headed for several years now in terms of favoring wide receivers, well then it's fair to assume you're just being stubborn for the sake of being stubborn. The good news is, that's fine, I guess; there is no one way to the top of the mountain and winning a fantasy championship. As my mentor Sigmund Bloom always says "every strategy works if you pick the right players" and the same is true for running back-heavy teams. If you take running backs with your first three picks and they all stay healthy, cling to a workhorse role and perform to ADP expectations or above, and then you nail all your mid-round wide receiver picks, you can build a dominant fantasy squad. However, as we've seen, the evidence suggests that such a team carries an incredibly small margin of error and all of those occurrences coming to pass are extremely unlikely. After all, we are not that good at predicting outcomes in football with perfection and to base a strategy on "all my picks hitting because I know better" carries layers and layers of flaws. Even one of the biggest proponents of a Robust Running Back strategy earlier this offseason wrote up a mea culpa recently explaining how he saw the light. To ignore that the evidence that points to wide receiver-heavy teams carrying the optimal and safer lineup construction is sticking your head in the sand. To disavow the Zero-RB strategy completely or to claim it cannot work is nothing short of silly. The evidence is overwhelmingly against you. If you don't want to go full Zero RB (wait until at least the sixth round to take a running back), I understand. Even the creator of the theory, Shawn Siegele understands too, as he explained in his recent Hitchhikers Guide to the Zero-RB Universe. Not only does Siegele note it is "not the only way" of contingency-based drafting he also reminds us that his most successful wide receiver-heavy team in the tournament that inspired the series featured one early running back, Jamaal Charles. I find myself agreeing with Shawn in that last point. I am not a true Zero-RB drafter in every league, though I certainly do use it. Rumford Johnny, one of the sharpest fantasy minds I know, often talks about a #ModifiedZeroRB strategy where you take one or two running back to complement all wide receivers at the other picks in the first six to seven rounds. That has been my preferred strategy this year, and one I used in an APEX Industry League Draft that you can find here. If Zero RB is too much for you, this might be the way to go about building your teams, even though both strategies work. Either way, I'm not leaving my drafts this year without two top-15 wide receivers and I don't think you should either. Whether you go Zero-RB or build your teams in a more modified fashion that still emphasizes a wide receiver-heavy approach, I believe the evidence is strongly on your side. Wide receivers are the kings of fantasy football, and that is here to stay unless recent trends massively reverse course.